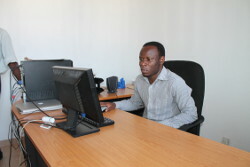 The newly recruited UbuntuNet Alliance Communications Officer, Hastings Ndebvu, has appealed to the Alliance’s NREN Members to supply his office with research and education inventions and innovations happening in their communities to enable the office enhance the visibility of Africa’s research and education networking in the global research and education community. The new officer was recruited in July 2015 following the departure of his predecessor Patricia Mtungila who left the Alliance in May 2015. A former mainstream journalist who worked with some of Malawi’s leading media houses, Hastings, who will be based at the Alliance’s secretariat in Lilongwe, Malawi, has for the past two years been working as a journalism and communication lecturer at the Malawi Institute of Journalism (MIJ) which is one of the country’s most reputable media training institutions. And speaking on his new role after completing a month in office, Hastings says he is enjoying his new challenge but called on NREN Members to support his office in making the UbuntuNet Alliance and its NREN Members visible to other regional and global research and education networks. Hastings says his office will also strive to bring to the attention of NREN Members research projects from other regional research and education networks so that the Alliance’s members are inspired and motivated. He also adds that initiating, maintaining and promoting a conducive partnership between the Alliance and its working partners are important for the benefit of the Alliance. Hastings holds a Bachelor of Arts in Journalism from the University of Malawi.